By Carl Slaughter: A roundup of space exploration news. Luna, ho! China accelerates its Moon program. Spaceworks Enterprises is currently using a grant from NASA in the amount of $500,000 to develop systems that could keep a human alive in “low metabolic stasis” for long space trips, such as those to Mars. Spaceworks CEO John Bradford told reporters at a recent panel that “it’s medically possible” to create a system like the one from the film [Passengers], though the first steps will be smaller than the decades-long hibernation Pratt and Lawrence endure. Not waiting. Lockheed Martin projects Mars base by 2028. Stepping stone. Boeing’s Deep Space Gateway. Boeing is helping develop the Space Launch System, NASA’s next endeavor to get humans into space with the goal of returning to the moon and eventually Mars. 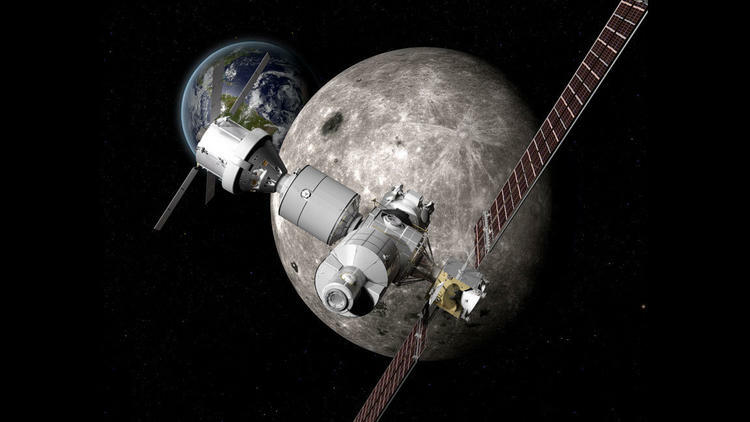 While it won’t be until late 2018 before the SLS Exploration Mission-1 takes flight, down the line Boeing would use SLS launches to get a habitat Boeing is calling the Deep Space Gateway near the moon. This habitat would be powered by a solar propulsion system and Boeing says it could be used for both government and commercial deep-space partnerships including missions to the moon. Map of the future. Integrated Space Plan update. As a spokesperson for Integrated Space Analytics noted, the Integrated Space Plan (ISP) will offer a detailed, 100-year forecast of the future in space. An ISP was first developed in the 1980s, giving people a good idea of how major space infrastructure elements fit together. In 2014, the team from Integrated Space Analytics updated the ISP, and brought it to the internet for the first time. Follow the money. Goldman Sachs Tells Investors: Space economy will become a multi-trillion dollar industry within the next two decades. Freebies. Download NASA software free. With 15 different categories, ranging from Design and Integration to Climate Simulators, there’s plenty of browsing material for you to check out at your leisure, but NASA kindly compiled a Top 20 most requested software titles for you to start your software download journey. Sky scheduler. Monitor Space.com’s Space calendar. LAST UPDATED April 7: These dates are subject to change, and will be updated throughout the year as firmer dates arise. Please DO NOT schedule travel based on a date you see here. Launch dates collected from NASA, ESA, Roscosmos, Spaceflight Now and others. Please send any corrections, updates or suggested calendar additions to hweitering@space.com. NASA budget. Is this another case of fake news or does Trump actually support space exploration? This entry was posted in Deep Space 770 and tagged Carl Slaughter, NASA by Mike Glyer. Bookmark the permalink. Trump wants to explore space, not look at Earth, because that might actually find more evidence of human-based climate change.